Sometimes you are faced with droopy eyes, cute ears, a huge heart, and a pleading, begging expression that doesn’t even need words….and I’m not even talking about the dog yet! This was how my 7-year-old daughter looked when she asked my husband if they could go to the animal shelter and look at dogs. Perhaps even get one? This was something we had discussed for a while and it seemed like as good a day as any to begin our quest for a family pet. A couple of hours later, Hershey, the 6-month-old chocolate lab became a member of our family and she seemed almost as happy about the arrangement as the kids were! We knew there would be the normal puppy behavior of chewing shoes and other small items if we left them carelessly on the floor. We knew there might be potty accidents while she acclimated herself to our home and her new routine. We planned on and expected all of these things and more. As parent, we set up two important rules. 1. Hershey will NOT sleep on people beds. Once she is definitely house trained, she can sleep on a bedroom floor, if she wishes, but NO beds. 2. Hershey will not be given people food. Ever. It’s not good for her and we wanted to make sure she would always be a healthy dog. 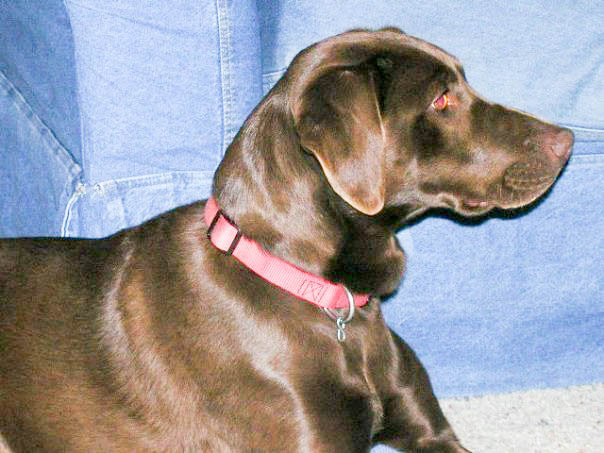 Hershey grew to be a beautiful, lovely girl who was a pure joy to be around. Labs have hearts so big, I’m not sure how it fits inside their body. She loved us all, no matter what, and loved to pretend she was a tiny lap dog. We took her swimming, camping and she was our friend and walking companion. And for the most part, she didn’t get into any trouble. But there was that one time when I came home from work, walked upstairs to my bedroom and as I passed one of my daughter’s rooms, I spotted something white and fluffy out of the corner of my eye — in a place where nothing white and fluffy would normally belong. I turned and saw batting in the middle of the bedroom floor. My first thought was that a pillow had been destroyed. But as I entered the room, I realized there was WAY too much of the white stuff to be a pillow. No, this was bad. It was very, very bad. It wasn’t a pillow. It wasn’t two pillows, either. It was a full-sized bed mattress! Or at least the center of one. Somehow, and for reasons still unknown, Hershey had dug through the bedding and began eating and tearing up the mattress and pulling all of the stuffing out of its insides. I was shocked. I just stared at the bed in shock, wondering WHAT in the world had come over the dog??? Needless to say, she spent the next few night sleeping in the garage. We forgave her (it took some of us longer than others), bought a new bed and chalked it up to weird puppy behavior. We still loved her, took her on walks, cuddled with her on the floor while watching TV and she grew out of that puppy stage eventually. She calmed down and we didn’t have to watch out for our shoes (or mattresses) quite as carefully. And for the most part, she didn’t get into any trouble. But there was that one time when I cooked a ham for Easter. It was during a time when my husband was working two jobs and although it was a holiday, he had worked that Sunday afternoon and evening. I fed our children some ham, cheesy potatoes and other traditional Easter food. Knowing my hubby would be home from work in less than 15 minutes from when I cleaned up dinner, I returned the ham to the oven until it was piping hot again, then set the pan on the counter so that he could eat some right when he got home. Right on schedule, I heard the front door open and hollered from the other room, “There’s ham on the counter for you and then a plate of the other food is in the fridge.” A moment or two later, he called back, “Okay, thanks. Where did you say the ham was?” By then I had joined him in the kitchen and pointed, “It’s right there on the……” I stared. No ham. At all. Just an empty pan. My children weren’t old enough to put the ham into the refrigerator for storage. But I looked inside anyway. No ham in the fridge, either. No ham anywhere. This was a BIG ham. One that I imagined would provide a few days of leftovers for lunches and probably even a ham-and-something casserole. I actually wondered if someone was playing a joke on me. That’s when I heard a soft moan from the family room. As I walked around the corner, I saw Hershey sprawled out on the floor. Her stomach as swollen and big and round as…..a ham. Obviously, what had been delicious and savory to her mouth was now giving her gut a serious ache. I was MAD. I couldn’t believe she had somehow managed to get high enough onto the counter to get to that meat. I hadn’t left the pan near the edge, either. But obviously it was close enough for her to somehow reach. We loved that dog for several years until we moved to a location where we didn’t have a fenced yard and had to find another loving home for her. “Get a puppy,” they said. “It will be lots of fun,” they said. And they were right. Thanks for loving us back, Hershey. P.S. She (and we) stuck to rule number 2 (aside from the ham) quite faithfully. She was healthy and happy. But rule number 1….well, we quickly learned that it’s nearly impossible for dog lovers to say no when your dog wants to cuddle.